Critics of plans to put up Sámi road signs in Tromsø, Norway, accuse the city of trying to rewrite history. Attentive delegates to Arctic Frontiers, a big annual conference that took place in Tromsø, Norway, last month, will have noted that next year’s gathering will be held in early February. Changing the dates will allow it to overlap with Sami Week, a city-wide festival that itself coincides with Sámi National Day, held each year on February 6. Arctic Frontiers is one of the region’s biggest events, and the organization that stages the conference reckons it brings 3,000 people to the city. The shift, therefore, has the potential to bring with it a slew of additional exposure. Currently, Arctic Frontiers is held in the gap between two of the three big culture events organised in the city at this time of year; the Tromsø International Film Festival ends the weekend the conference begins, while Nordlysfestivalen, a music festival, begins when it ends. Timing it with Sámi Week may help put to rest past criticism of limited Sámi involvement in Arctic Frontiers. What delegates unable to follow the local media during this year’s Arctic Frontiers likely missed was a sudden flaring up of a discussion about whether Tromsø is, in fact, a Sámi city, and thus whether municipal authorities should be required to foot the bill to put up signs identifying 19 places by both their Norwegian and Sámi names, including the city itself. By law, Norwegian authorities are required to add Sámi (as well as Kven, another minority) names to signs, if they are determined to be traditional, or if groups from either minority have lived or worked in a specific area. Opponents of the measure, led by Bodil Ridderseth Larsen, a member of the local council whose criticism breaks with her party’s support for the signs, say that, for the places in question, this is not, nor has it ever been, the case. The validity of the claim is a matter for the academics sort out. 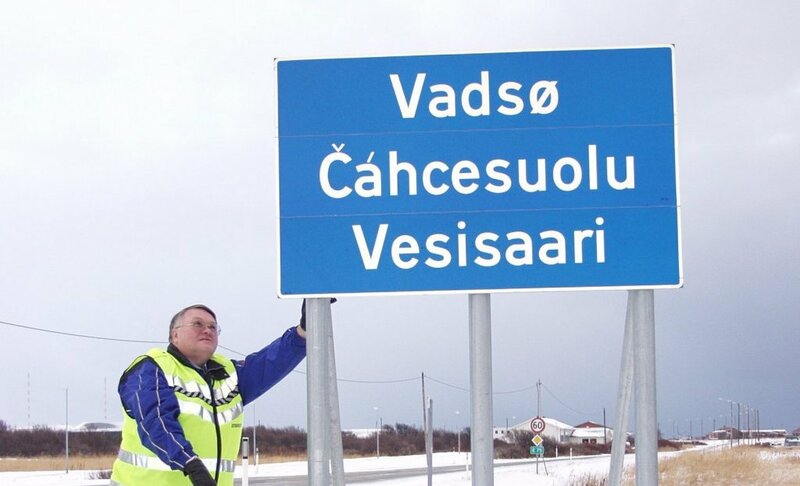 While they are doing that, the city’s 1,500 or Sámi will go on calling it Romsa. Others note, that, even if she were right, Tromsø is the group’s second-largest population centre in Norway, behind Kautokeino, and that putting up signs falls under a requirement written into the Norwegian constitution that requires measures be taken to promote Sámi language, culture and society. Other institutions in Tromsø already use Sámi on signage and in other communication, as do local and regional authorities elsewhere in Norwegian Sápmi. Bodø, for example, went through the same process of granting Sámi names official status in 2004. Instances of road signs being vandalized have been reported, but officials say this does not reflect the general attitude. In a letter-to-the-editor published by Nordlyset, a local news outlet, on January 21 and since roundly criticized by her own party members, other local lawmakers and members of the Sámi community, Larsen argued against the additional names, in part, because Tromsø was calling itself ‘the Paris of the North’ before it was known as a Sámi city, and that this would make French names more appropriate. These days, modern visitors are more likely to recognise the ‘Arctic capital’ nickname, by which the city markets itself abroad. When delegates arrive next year, it may be hard for them not to note that the city has yet another name it can go by. Also this week, in Canada, mushers taking part in the 36th Yukon Quest are in their first week of what will be as few as 10, or as many as 20 days on the trail of what is billed as the ‘toughest race in the world’ due to its distance 1,000 miles (often requiring mushers to sleep on the trail), the terrain (it crosses four mountain ranges) and the punishing weather encountered on the trail (temperatures down to -40 F). Mushers left Whitehorse, Yukon, on Saturday. The first musher is predicted to arrive in Fairbanks on February 11, though a date and the number of seats needed for the finishers’ banquet remains to be determined. This week also marks the first full week of Uqausirmut Quviasuutiqarniq, Inuktut language month. This year, celebrations will focus on traditional songs and chants, which were traditionally used as a means to pass down elements of Inuit culture, traditions and language. For today’s children, learning songs is also a means of learning their history, since it allows them to pick up terminology they might otherwise not be exposed to during their daily lives. Schools, daycares and libraries have all been provided with language-learning material that can support the month’s goals. In order to keep the music alive after Uqausirmut Quviasuutiqarniq ends, Nunavut’s Culture and Heritage Department plans to release collections of songs and chants on DVDs, CDs and print. CAFF, an Arctic Council working group addressing biodiversity, gathers to finalize the work it will present this May, when the Finland hands over the chairmanship to Iceland. One of the group’s marquee projects is its Arctic Migratory Bird Initiative, in part due to their significance as indicators of the health of the ecosystem, in part because they serve as sources of food for indigenous groups in all Arctic Countries. Another reason why the initiative worth watching closely: protecting migratory birds requires Arctic countries to collaborate closely with observer states and even non-observer states. As the Arctic Council assesses its future relationship with observers and its role in an internationalized Arctic, CAFF and its work may not be just for the birds. As part of its Arctic Council chairmanship Finland this week holds a health conference focusing on the one-health approach to health and well-being. One health focuses on participatory community-based approaches for to addressing health issues and takes into account traditional and local knowledge. It considers factors like the environment, wildlife and domestic animals and seeks to address problems through social as well as technological solutions. The Week Ahead is a preview of some of the events related to the region that will be in the news in the coming week. If you have a topic you think ought to be profiled in a coming week, please email [email protected].